Barrington Stage Company, Pittsfield, MA. The life of a mathematical genius reputed to have had Asperger’s Syndrome and who became a British war hero for his work on cracking the Enigma Code to help end WWII is inherently interesting, but not necessarily theatrical. Add the facts that he was arrested for homosexual “gross indecency” and prescribed female hormones to “control” his sexuality, and that he has become known as the “father” of artificial intelligence, and the story becomes even more compelling, but how could this possibly translate into good theatre? 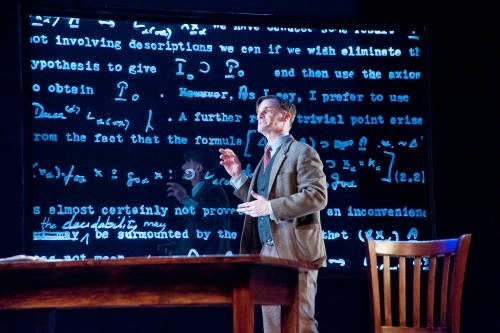 The answer is in the brilliant, tour-de-force performance of Mark H. Dold who makes the life of Alan Turing come alive in Barrington Stage Company’s bold production of the 1986 London hit show, "Breaking the Code." The title is a double entendre, intended in part to explain the literal code breaking of cryptography, but it also refers to the “code of secrecy” that surrounded homosexuality during Turing’s life (1929-1954). Seven additional actors are all first-rate, but Dold commands the stage and tells the story of a man who figures out the logic of numbers even though the logic of human beings eludes him. The production is not perfect, however. The script suffers from trying to cover too much, and shifts from one time period to another are somewhat confusing. The performance comes in at 2 hours and 45 minutes (including intermission) which may stretch the patience of a summer audience, but for those with curiosity about Turing, or respect for a performance like Dold’s, "Breaking the Code" will be a memorable experience. Berkshire Theatre Group’s Unicorn stage is the ideal venue for “Benefactors” -- a small play, with small cast, set in one room (a kitchen), about a small story (yet, one should never judge the importance of any story to its participants). Yet, there is universality in the play’s theme of helplessness and helpfulness, encroachment and passivity. Eric Hill directs four actors, representing two married couples living in 1970’s London. The characters are middle-class, each with his/her own career. the women choose to stay home with the kids. Sheila, a former nurse in a ‘helping’ role in the community, becomes a pathetically needy weakling. Jane, an anthropologist by trade, is a strong-willed albeit reluctant helper to all of the characters who enter her kitchen. Sheila’s husband Colin is a brute who believes that he is helping the world as a political rebel. Jane’s counterpart David is saving a part of his own world by addressing the needs of the poorer class population. Everyone is helping, trying to help, and/or pretending to help themselves and everyone else. None are successful. Each character, stepping to the side of the stage under dim light, offers frequent monologues serving as soothsayers to themselves and to the audience. Actress Corinna May propels the movement of the play as her Jane is somewhat in charge of situations; she even stands erect and commanding. A long-time star at Shakespeare & Company, May handles contemporary English and this script’s nuances equally as well as the Bard’s clever words. No small task. David Adkins’ David successfully creates an idealist scratching for a purpose. 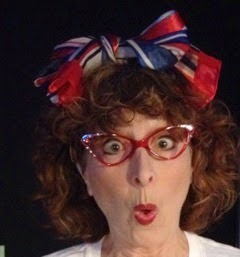 Barbara Sims, as Sheila, wears dowdy and ill-fitting clothing to accentuate her unassertive demeanor. The director could have molded Sheila as a caricature, but Sims and Hill carefully resist. Walton Wilson keeps Colin on one level with no redeeming qualities. It takes an actor’s skill to motivate an audience to dislike him and, at the same time, care enough to want to know his outcome. Playwright Michael Frayn, whose famous works are “Noises Off” and “Copenhagen,” is a fine writer whose “Benefactors” is atypical of both of these works. A combination of threatening weather and esoteric repertoire may have limited attendance at Sequentia’s recent Tanglewood engagement, but the modest audience that braved the elements was treated to a rare excursion into unfamiliar musical terrain. 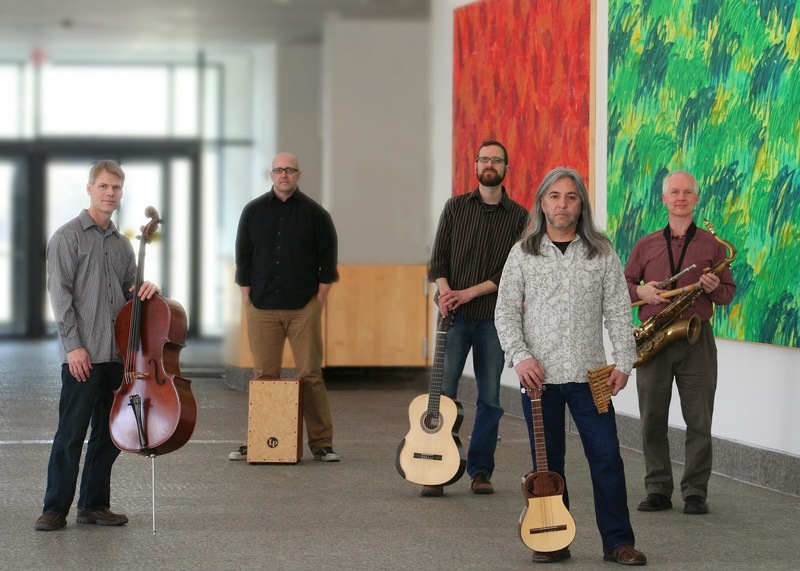 Founded in 1977 by Benjamin Bagby and the late Barbara Thornton, Sequentia is one of the world’s foremost ensembles specializing in medieval music. Their many recordings and concert tours have renewed interest in and inspired further research into this rich musical genre. Their Tanglewood program featured music from the Carolingian era, the two centuries following Charlemagne’s coronation as “Holy Roman Emperor” in 800. The thirteen pieces on the program included two instrumental selections, but most were Latin texts sung by one or two voices, with English translations projected from the back of the stage. Though many had unknown authors, several were written by Charlemagne’s court poet, Angilbertus. Their subject matter ranged from praise for the king to a fight between two warriors to the very different plights of two women facing death. The performances by Bagby on voice and harp, Norbert Rodenkirchen on flutes and cithara (a kind of lyre), and vocalist Wolodymyr Smishkewych were dramatic and colorful. Bagby delivered the German text of “The Song of Hildebrand,” about a long lost hero whose son, Hadubrand, doesn’t know him when they meet in battle, with urgency and forceful diction. Smishkewych used his sweeter voice to poignant effect in the “Canticle of Eulalia,” a harrowing tale, in old French, of a beautiful young woman’s martyrdom. The virtuosic Rodenkirchen played with consistent beauty and purity of tone no matter how often he switched among his exotic-sounding instruments. The concentration of the program into 90 minutes without an intermission and the closing of Ozawa Hall’s rear wall to keep a raging thunderstorm from drowning out the music made this an unusually intimate journey into the past. The enthralled audience called the performers back to the stage several times before the concert hall doors opened to reveal that the music had driven the storm away. “Fiddler on the Roof,” a beloved treasure of the American musical theatre, is celebrating its 50th anniversary at the Goodspeed Opera House, flawlessly directed by Rob Ruggiero, with choreography recreated from Jerome Robbins’ original, by Parker Esse. A story of traditions, some preserved, some broken, “Fiddler” is also a story of family love, of struggles and changes –told through an unforgettable score by composer Jerry Bock, lyricist Sheldon Harnick, and book by Joseph Stein. From the opening strains of “Tradition” to the bittersweet rendering of the final notes of “Anatevka,” “Fiddler’s” melodies are instantly recognizable. Their delivery by this exceptionally talented company resonates with care and feeling throughout, culminating in a moving performance of “Sunrise, Sunset,” by the entire company. Against a background of Russia in the early days of the 20th century, “Fiddler” focuses on the transition and difficulties faced by the family of Tevye, his wife, Golde, and their five daughters. 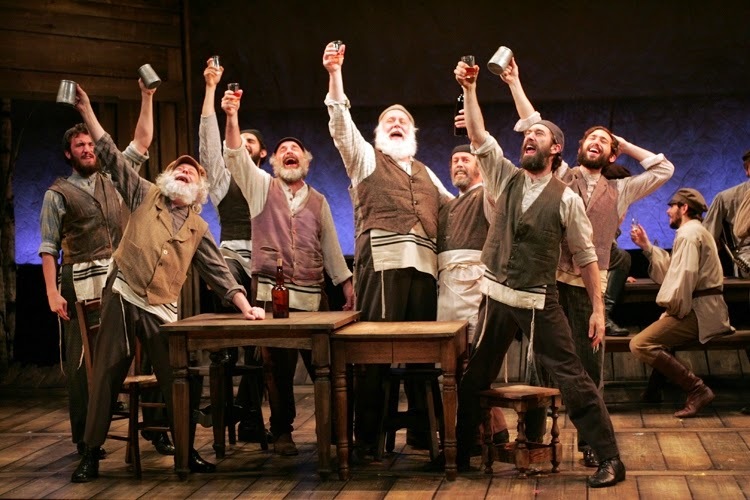 Tevye, played with warmth and humor, by Adam Heller, is the master of his house, at least in his own mind. His wife, Golde, acted by Lori Wilner, runs the house with love masked by a sharp tongue. David Perlman’s Motel the tailor, and Abdiel Vivancos’ Perchick, a young revolutionary student, reflect the growing spirit of the young. Jan Brissman’s determined Chava, delivers a farewell to her family that is achingly touching. John Paynok’s Lazer Wolf and Cheryl Stearn’s Yente, provide welcome moments of laughter. This “Fiddler” is indeed a memorable, not-to-be-missed production of a classic! The Emerson String Quartet is one of the most durable ensembles on today’s classical music scene. Three of its founders in 1976 are still members, and their only personnel change occurred in 2013, when cellist Paul Watkins succeeded original cellist David Finckel. The “new” Emersons made an impressive Tanglewood debut last summer, and their return visit to Ozawa Hall this year featured an extended program of Shostakovich’s last five string quartets. The original Emersons recorded all fifteen of the composer’s quartets to wide acclaim in 2006, and in recent years the ensemble has made a specialty of presenting the last five together, which, like Beethoven’s late quartets, are more inward and even mystical than their predecessors. These quartets were all written between 1966 and 1974, a year before Shostakovich died. Though much of their music is loose in form and quiet in tone, the fifteenth stands apart as the composer’s longest, most rarefied and startling quartet. Its six movements are all marked “Adagio” and played without pause, ending the concert on an eerie note that was also exhilarating in its focus and intensity. It’s hard to imagine a more riveting performance of this demanding music. From the echoes of Russian folksong in the eleventh quartet, the grief and anger of the twelfth, the knocking sound of the bows’ wood striking their instruments in the thirteenth, the romantic mood of the fourteenth, through the dark, death-haunted fifteenth, the musicians never wavered in their technical precision and interpretive depth. Their versatility was reinforced as violinists Eugene Drucker and Philip Setzer swapped first chair duties and cellist Watkins and violist Lawrence Dutton outdid each other in the variety of tonal shadings they coaxed from their respective strings. With two intermissions (after the twelfth and fourteenth quartets), the three-hour program was an immersive experience for performers and listeners alike. Few members of the rapt audience left at either intermission, and those who completed this profound journey with the Emersons gave them multiple and well-earned standing ovations after the hushed close of the fifteenth quartet had faded into the night. Spotlight: What would you say about Complete Works to entice a non-Shakespeare lover to see this play? In particular, the title alone implies that the audience will spend hours upon hours sitting in a theatre, watching segments of all 37 plays -- the ones they were forced to read in high school and, worse yet, the ones they have never even heard of. Croy: Well, although this is certainly a whimsical, over-the-top evening of comedy, I keep thinking of it as a “lovingly playful homage” to Shakespeare’s plays—we do touch upon (okay, at least, mention) them all, but most of the plays are presented through the lens of a skewed affection…I typically stress the “loving” and “affectionate” descriptors because as wacky as this play gets (and it certainly does go there), I believe that the guys who wrote this piece had a deep love of the plays. I don’t think anyone needs to study up to see Complete Works…it’s a bit like The Muppet Show, in that there are multiple layers of jokes…there’s plenty for people with no familiarity with Shakespeare to enjoy, and then there are jokes for people with great familiarity with the plays. Spotlight: How are you and the three actors possibly able to go through the rehearsal process without completely and constantly breaking up in hilarious laughter every minute? How does one maintain professionalism? Croy: By redefining the term “professionalism." But seriously, our rehearsal room was a non-stop jamboree of laughter, as well it should be. That atmosphere is totally appropriate to a play like this— not only because of the sheer amount of silliness, but also because it’s a joyful comedy, and spending our days laughing together seemed like a good place from which to create that. Spotlight: What is your directing style? Dictatorial? Laisez faire? Improv? How much input do you permit your actors, if any? Croy: I was first drawn to Shakespeare & Company by the openly collaborative spirit here. So not only do I permit the actors to have input, I demand that they be participants in the process of creating the show, especially for a play like Complete Works. These actors have serious game when it comes to comedy, and it would be criminally stupid of me to ignore that. This is a really funny script, with a broad comedic vocabulary, so in putting our production together, I’ve been looking to build the show from the moments, the ideas, the aspects of characters that these three actors find enjoyable, rather than walking into the room with a finished product in mind. Spotlight: You have been onstage and are now backstage for this play. Do you see Complete Works in a new light now? Do you wish you were one of the actors having a hell of a good time, or "just" the director? Croy: Interestingly, I do find that the societal context has an impact on this play—this was developed originally 20 to 25 years ago, and our attitudes have shifted and changed in so many way. We’re in the middle of our Preview performances now, and I’ve been fascinated by the differences in the audiences’ responses, as compared to 15 years ago when we first did this play. Some of the jokes have had to be updated, others have had to take a different tone. On some issues, our audiences seem to need a different point of view. I also believe that comedy is an ever-expanding universe. When a television show like The Daily Show or The Colbert Report hits popular culture, it refines our taste in political commentary; when Seinfeld hits, it refines our taste in absurdism; when The Hangover comes along, it refines our taste in silliness… so one of the great challenges in approaching a script like this is in staying ahead of the curve. Spotlight: I have seen two of the three actors perform together numerous times -- Ryan Winkles and Josh Aaron McCabe. Frankly, they need no script. Both could read the phone book aloud and the audience will be in stitches. I am sure that the third actor, Charls Sedgwick Hall is top notch as well. So, how do you enjoy working with these guys? Did you hand-pick them for this play? Croy: Yes, I did… Ryan & Josh are certainly no strangers to this style of comedy, or the demands it makes on actors. Charlie and I worked together here back in 1984 & ’85 (! ), and I’ve wanted to work with him again ever since. He’s a wonderful actor with a heart the size of Kansas. Spotlight: Costumes and props are so important in this play. It seems to me, having seen Complete Works six times that the rule of thumb is...the cheaper and the cheesier the better. If I am correct, I believe there is a rubber chicken? Croy: I get your point—I’ve seen this 6 - 8 times myself, plus the five versions that sprung from ours. I have to say, though, that the Costume Designer and I decided to go a bit more upscale on this one — we’re looking for a world in which the whimsy springs from a slightly more “complete” vision of each play. Spotlight: And speaking of costumes, please describe the choreography of the talented backstage crew who help dress three actors in the roles of over 700 characters in just 2 hours. What is the secret to making this all happen in split second time? Croy: Velcro, artful snaps & zippers and gravity and…I don’t even know what. We’re certainly blessed to have two compadres backstage—Jessie Chapman and Ben Hover—who are experts at this kind of thing…no joke at all, without them, this would not be possible. 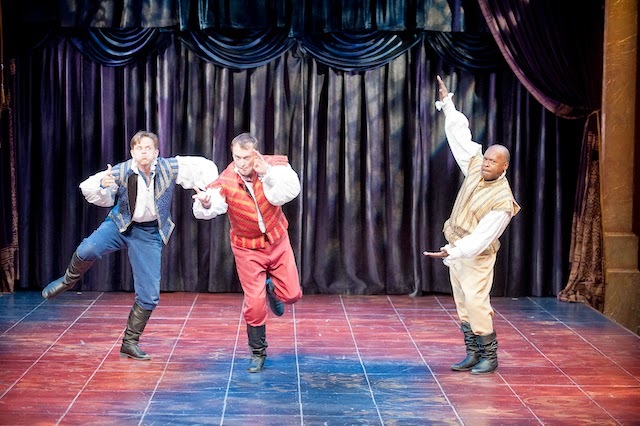 Spotlight: How do you think Shakespeare would feel about Complete Works? Would he approve? Is he turning in his grave? Or is he having a hoot on this, his 450th birthday? Croy: I’d say he’d have a good time with this, given the level of low-brow comedy in many of his own comedies, I think he’d get the jokes. Stephen Sondheim’s “A Little Night Music” is a treasure of the modern American theatre. Considered by many to be Sondheim’s greatest work, it is rarely absent from stages around the world including occasional productions by leading opera companies. In its current reincarnation by the Berkshire Theatre Group, “Night Music” has been spectacularly recreated with inspired direction by Ethan Heard, joyous choreography by Alex Sanchez, and flawless performances by a sensational cast. Hugh Wheeler, whose book allows ample space for Sondheim’s exquisite lyrics and magnificent score, has skillfully adapted the story, “suggested by a film by Ingmar Bergman,” It tells a tale of love that, through a series of clever plot twists, resolves the difficulties of several mismatched pairs allowing them to find their world set straight at the final curtain. In “Night Music,” the musical selections are never merely set pieces, but are integrated parts of a whole, carrying the story forward. By opening the performance with the full cast on stage in an elegantly executed performance of “Night Waltz,” the mood is set. As each key character is introduced, their personas and situations are quickly established. 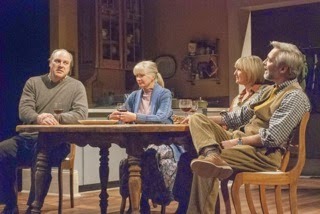 Recently married Fredrik, played by Gregg Edelman, performs “Now” with reluctant patience; while his wife Anne, portrayed by Phillipa Soo, offers tentative promise through “Soon.” Son, Henrik, exuberantly acted by Matt Dengler, reveals his frustrations and impatience in “Later.” The three solos are ultimately blended in a delightful trio. Penny Fuller, as Madame Armfeldt, has a grand time as a grand dame in her “Liaisons” recollections, while Maureen O’Flynn demonstrates her flair for comedy with “The Glamorous Life” and later, the depth of her character with “Send in the Clowns.” Kate Baldwin’s Charlotte, captures the essence of irony in every line, while Graham Rowat’s Carl-Magnus is oblivious to his own “tin soldier’ persona. Emma Foley, as the young Fredrika, reveals wisdom beyond her years in a charming portrayal; while Monique Barbee’s spirited delivery of “The Miller’s Son,” sparkles as a show stopper. The Berkshire Theatre Group’s “A Little Night Music is a leading contender for this season’s top production and a not-to-be-missed opportunity for all theatre lovers.